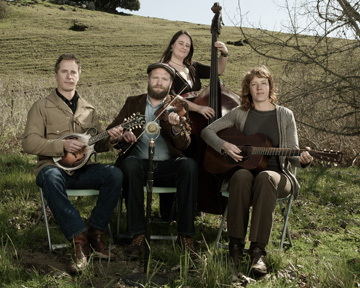 The 11th annual Berkeley Old Time Music Convention (BOMTC) continues with stringband magic, down home yodeling and flatfooting, and the jazzy side of old time music. Starting at 5:00 p.m. BOTMC performers will host free jam sessions in the Freight lobby and, weather permitting, in front of the building. Bursting out of the burgeoning old time scene in Portland, Oregon, Foghorn Stringband plays fiddle tunes with the energy and edginess of punk rock, and delves into vintage country, honky-tonk, and Cajun music with four exceptionally strong vocalists who know their way to the heart of a song. With Sammy Lind on fiddle, Caleb Klauder on mandolin, Nadine Landry on bass, and Reeb Willms on guitar, the band has a sound that could be coming to you from an Appalachian front porch or a big console radio in a 1930s living room. They play old time music deeply rooted in the American folk tradition, but they put their own stamp on it, carried along by their driving rhythms and fierce determination to keep traditional music alive and exciting for this and future generations. Dirk Powell’s first instrument was harpsichord, but he soon began learning banjo and fiddle from his grandfather in Kentucky. He co-founded the Cajun group Balfa Toujours and has done extensive recording and film work with such artists as Jack White, Loretta Lynn, and Spike Lee. Current projects include collaborations with Riley Baugus and Cedric Watson, and for the past few years Dirk has toured internationally as a member of Joan Baez’s band. He often teams up with members of the Foghorn Stringband. Eddie Bond tears it up on fiddle, banjo, autoharp, and guitar. He sings, yodels, and tells stories, and his flatfooting is exceptional. Eddie got his start as a performer at age three, earning tossed quarters as he danced to the music of great-uncle Leon and his band, the Hillside Boys. Eddie started the band Oldtime Tradition after getting out of the army in 1996, and became the fiddler for the New Ballard’s Branch Bogtrotters around 2001. He lives in Fries, Virginia – ask him how to pronounce it! Josh Ellis discovered old time music when he moved to Galax, Virginia from his home in Bluefield, West Virginia. He had played rock and roll guitar in West Virginia, and one Sunday afternoon his Galax landlord asked him to play guitar with him at a small gathering. He fell in love with the banjo on the spot and spent time learning from many local banjo players including Ray Chatfield, Peco Watson, and not-so-local Bill Birchfield of the Roan Mountain Hilltoppers. Along with Eddie, Josh is also a member of the New Ballard’s Branch Bogtrotters. Suzy Thompson, founder and director of the BOTMC, is known for her soulful fiddling on rags, blues, and Cajun music, and for her evocative blues singing. In 2011, she was appointed artistic director for the Festival of American Fiddle Tunes. Her husband Eric Thompson started exploring old time music as a teenager in the early 1960s and has made dozens of recordings as a sideman and bandleader. His latest project is Kleptograss with Jody Stecher, Scott Nygaard, and others. Craig Ventresco became obsessed at an early age with 78-rpm recordings of ragtime and jazz – while the other kids were listening to Led Zeppelin, he was spending his allowance on obscure sides by Billy Murray and Arthur Collins. His explosive, melodic, and inventive guitar playing is featured on the soundtracks of the films Crumb and Ghost World. Meredith Axelrod’s singing is an unusual combination of demure and passionate; she’s a powerful rhythm guitarist and lately has been playing the cello in the style of the East Texas Serenaders. Together, these four Bay Area musicians explore the ragtime and jazzy side of old time music.